One day curiosity struck them & they wondered about their existence, the source & the end of the universe & the unfathomable sea, but they could find no answers. Eventually, on inscrutable intuition, the presence & essence of the Devi dawned on Kaitabha and he said to Madhu, ‘Brother, the Devi is the cause of this sea and of us as well.’ And soon they heard the celestial announcement of a ‘mantra’, which the demons began to chant. The Asuras chanted on, and were one in spirit with the Devi for a thousand years, till the mother divine was pleased with them & granted them a wish! Till one day, Madhu and Kaitabha saw an immense golden lotus in the sky, and sitting in it, steeped in dhyana, a four-faced and white-bearded, lustrous Brahma, the sire of everything. The excited Demons challenged Brahma to either fight them or relinquish his palace & flee. When Brahma flickered all his eyes open and saw the Asuras, he was taken aback & scared of their massive forms. He decided to rouse Narayana from his sleep and let him kill them. Brahma plunged down the stalk of the golden lotus, and besought Vishnu anxiously, calling him by him many and august names, begging him to quell the arrogant Demons. But nothing stirred Vishnu, who was in deep rest, in ‘Yoga Nidra’, the trance of the Devi. Brahma then prayed to the Adi Shakti, the mother divine & urged her to withdraw her inert form from Narayana and wake him up. Terror gripped his soul & he cried for help till the Devi, in her inert form of sleep, withdrew from Narayana, leaving in turn his eyes, mouth, nose, heart and finally his whole body. And thus, ‘Tamasi Devi’, the devi of inertia took form. 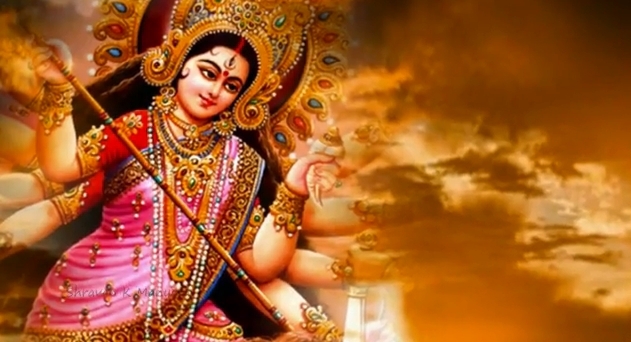 The Devi in her inert form was called ‘Tamasi Devi’. Madhu & Kaitabha; the demons where born out of the wax in the ear of Lord Vishnu during his inert state. They hence represent ‘Aversion’ & ‘Cravings’. So the birth of the demons from the ear of Lord Vishnu represents how distortions arise due to craving and aversions; which are mostly a result of what we hear (or see / touch / taste / smell) through our senses during our ‘Tamasic’ (Inert) state.